ADVANCE REVIEW! 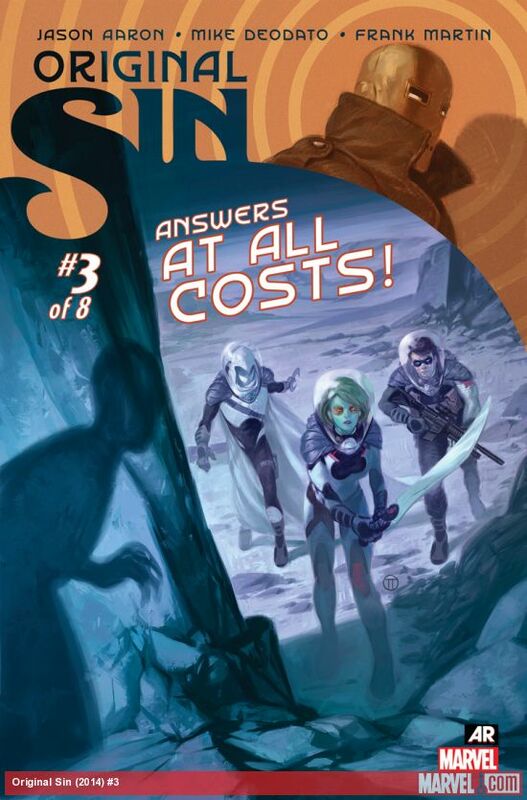 Original Sin #3 — or, the Internet is About to Rupture! Home » RANDOM STUFF » ADVANCE REVIEW! Original Sin #3 — or, the Internet is About to Rupture! NO SPOILERS … but brace for fan rage! Original Sin #3. Writer Jason Aaron. Artist Mike Deodato. Color Artist Frank Martin. First of all, how an artist can portray emotion on a character with a giant eye ball for a head is beyond me, but Mike Deodato does just that with Z list villain the Orb in the opening sequence of Original Sin #3, which is just damn impressive. Changes many, many things and will have one of two reactions from Marvel fans. One, it will send them over the edge and swear off Marvel forever, or, two, they will embrace it for what it is, a well-paced, well-structured plot twist that changes everything for two long standing Marvel characters. On the technical side, Aaron executes this shocking moment with dramatic panache, a true master’s stroke of narrative timing and batshit insane artistic execution. It was a hidden-in-plain sight moment of sheer dramatic intensity that works really well if a reader is open minded enough to endure this kind of thing happening to long standing characters. There are Hollywood ramifications of the moment that are going to cause a poopstorm of epic proportions across the nerdosphere. Brace yourself. As for the rest of the issue, Aaron writes each character in his huge cast with their own voice, which is a very difficult trick to pull off in this type of book. When the secret of the Watcher’s eye is released in a kind of truth bomb, the heroes’ reactions, Thor and Hulk in particular, are absolutely priceless. This moment was the core of the crossover and it was handled to perfection. The side missions are also handled well in this issue as the Punisher and Dr. Strange continue to delight, and the Moon Knight, Gamora, and Winter Soldier faction in particular take center stage. The story is very concise and grounded even though there are murdered planets with exit wounds, shell casing meteors, and a feature role for the Orb. I always award daring storytelling, and while this might send some jelly legged fans over the edge, I say this issue is a must read. The ending should wake anyone up from event fatigue. Seriously, if you have a low tolerance for nerd rage, stay off the message boards for the next few days. Good for Aaron, Deodato and company for shaking things up.